Allrecipes. Well, I didn’t know this was a Brazilian Cake, but it sure sounded like a great idea. Now, I’ve made it several times, both like the original recipe instructs, and also with some of my own variations. I’ve come to prefer my own variations, I have to admit 🙂 Here’s my version of a Tres Leches, coconut added. Deee-licious. So when you’ve made the other one enough, and need a little variety, I suggest this one. Preheat oven to 350 degrees F. Grease and flour a 9×13-inch pan. Whisk together flour, baking powder, and salt. In a medium bowl, beat the egg whites to soft peaks, then continue beating while slowly adding 1 cup of the sugar until stiff peaks have formed. In the bowl of a standing mixer, beat coconut oil and the remaining cup of sugar together until blended. Beat in egg yolks until evenly mixed, then incorporate the flour mixture in 3 additions, alternating with the 1 cup milk. Gently fold the egg whites into the batter (it will be a little stiff). Pour batter into the prepared pan. Bake cake in preheated oven until the top has turned golden brown, and a toothpick inserted into the center comes out clean, about 40 minutes. Meanwhile, in a small bowl, whisk together the evaporated milk, coconut milk, and sweetened condensed milk. Set aside. When the cake is done, remove from the oven, and use a the back of a skewer to poke all over the top of the cake, in 1 inch intervals. Evenly pour the milk mixture over the cake, and let it sit at room temperature for one hour. Meanwhile, spread coconut onto a baking sheet, and toast it in the 350 degree oven for 10-12 minutes, or until fragrant and browned. Remove and set on a rack to cool. Once the cake has cooled for an hour (the milk mixture should all be absorbed), cover the cake and refrigerate for at least three more hours. Right before serving, whip cream until soft peaks form, adding the powdered sugar and vanilla. 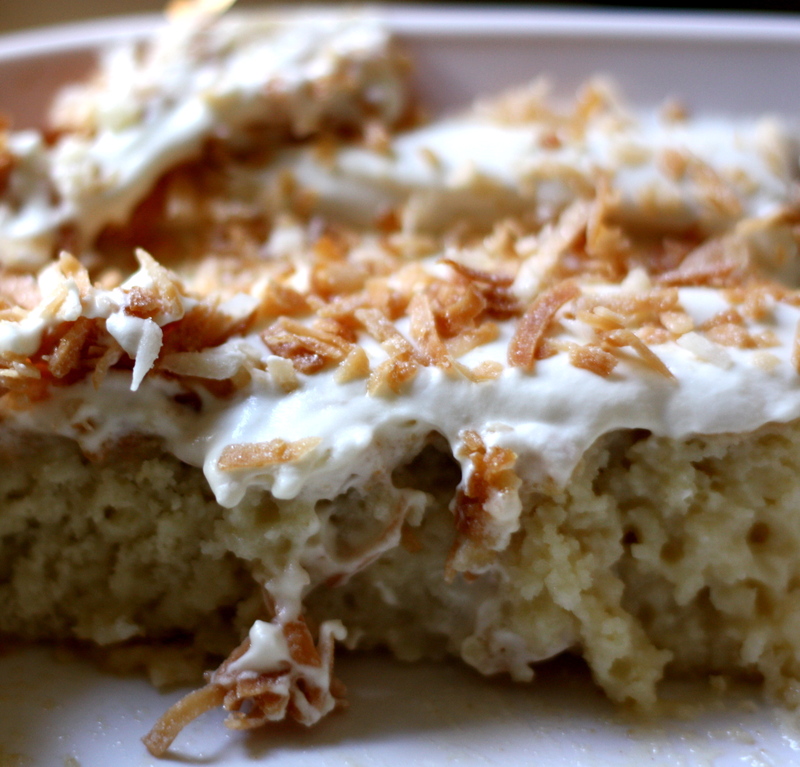 Spread the whipped cream onto the cooled cake, and sprinkle with the toasted coconut. I’m sure you will enjoy it!